Somewhere between Boston and New York is an impressive area of beauty and tranquility, the antithesis to its urban bookends. 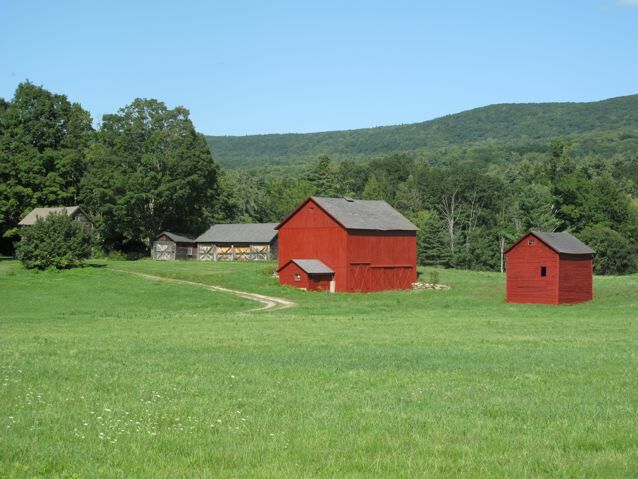 The Berkshires, named for the hills and mountains that surround the area and easily accessed via the lovely Taconic Parkway, is officially in Massachusetts, but it straddles Western Connecticut and the Southern part of it borders New York’s Columbia County. As such, it claims many New York natives as tourists, second homebuyers and transplanted permanent residents. Michael and I fall somewhere in between as frequent tourists who toy around with the notion of becoming weekend homeowners there. “Toy around?” More like desire, dream, drool over the idea of someday getting past this wretched economic stranglehold, our mental limitations, and into the real possibility of being able to visit the area every other weekend and nesting in our own digs. In the meantime we relish every opportunity to explore the area, with all its friendly little towns, interesting, well-reviewed eateries, activities and diverse B&Bs. After much hit or miss on the latter, we think we’ve finally nailed down our favorite spots, our homes away from home … that is when not booked up, which often can be the case on weekends from early July until the end of fall. And because, unlike say island vacations where staying in a hut can be satisfying as long as you have all day access to the sun, beach and a mai tai, your Berkshires visit can be a great deal about where you stay. If you’re of a certain age range and mindset, then Lenox with classical concerts at Tanglewood and quaint B&Bs drenched in antique furnishings and yellow or blue wallpaper could be just your speed. This is not to say that Lenox exclusively appeals to that set because to its credit, there are some hip, chic restaurants that attract fans of varying tastes and styles, not least of which is one of our personal favorites, Zinc and another, Fin Sushi and Sake. And the Stoneover Farm Inn in Lenox is a dream destination, with one of the greatest inn personality and proprietors, Tom Werman, at the helm. Although Tanglewood will do little to attract the rock and roll set, it is to be experienced by all at least once. This is the ultimate outdoors music setting- pull out the blanket, food and vino and relax while entrenched in the sounds of Yo Yo Ma and the sights of mountains. Just up the way from Tanglewood is Kripalu, the largest yoga center of the U.S. If you don’t necessarily want to sign up for a yoga class, still avail yourselves to the grounds’ breathtaking views and sit, read and relax. But, as far as lodgings are concerned, if something a little newer and upscale, rustic, but not overly so, is more to your liking, may I suggest a few of our recent finds. In the east end of the historic village of New Marlborough is the Gedney Farm Inn which is made up of recently restored Normandy styled barns. One of the renovated barns features 16 rooms and suites that although impressively designed with granite fireplaces, tiled whirlpool tubs and contemporary rustic décor, manages to maintain the integrity of the original barn structure, with exposed beams. The sincerely friendly, not over-bearing service (thanks, Mike), along with its quiet, sensuous setting, could make for a sufficient getaway in and of itself, without going much past the property lines. Just a brisk hike down the way from Gedney is their sister property, Mepal Manor & Spa. If you’re lucky, the owners dogs, Winnie and Clark, will join you on the trail. Mepal is taking things up a few more notches, and the price reflects it. If Gedney Farm is the attractive, fun treat, Mepal Manor is the luxurious splurge. Although I had the chance to at least peruse the property of the Manor, checking out the exquisite rooms and amazing views, I have yet to splurge and stay over. In between the two properties is another inn under different ownership. The Old Inn on the Green only mildly impressed us with their accommodations, but managed to live up to the hype for their restaurant. Under the creation and leadership of chef-owner, Peter Platt who worked with renowned chef Lydia Shire in Boston, the meals are elegant and traditional, yet unfussy and new. With the dining rooms lit entirely by candlelight, along with fireplaces, mahogany tables and wood floors, guests immediately feel transformed in time. That is until the seared fois gras melts in your mouth and you explore the wine menu, then you know you’re dealing with contemporary cuisine on a certain level. For a little more action and eating you need only go a few miles back from New Marlborough to Great Barrington. Probably a bit too “active” for the locals, the main area of GB, Railroad Street, is an undeniably attractive little hot spot and a taste of what I like to call a “proper town.” You see, the die-hard city slicker in me always has to spy out such areas even when exploring the countryside. To be clear, these are not touristy areas, but by “proper town” I mean certain shops, eateries and in this case, a cute little theater with new release films can be accessed, in addition to hiking, kayaking and resting. In fact, after years of dealing with packed movie houses in NYC, part of the get away for me is taking in a movie in a small theater, with a small audience. Can you imagine, no lines, no over-priced tickets and no cell phone conversations during the screening?! Before or after the movie, I strongly recommend lunch at Rubi’s Coffee & Sandwich for the best corned beef sandwich of your life, or dinner at the nearby restaurant Allium. Although you can’t go wrong with anything on the menu, I urge you toward the Berkshire pork. As mentioned earlier, the Berkshires season is in full swing from early July through the end of fall, with autumn having particular appeal with amazing colors on display and mild temps for hiking. This isn’t to say it’s uncomfortably packed with tourists like say the Hamptons in the summer- ugh!. This mountains and lake area is fortunately not even in the same ballpark as Long Island traffic and tourists, which is part of it’s appeal. But most of the B&Bs and inns are small and book up early during peak season on the weekends, making spontaneous excursions and securing some of the “best spots” a challenge. With a little planning (book ahead), or flexibility (playing hooky during the week) could save you money and ensure a special time had by all. Who knows, one of these years, if you can’t get a room at the Gedney or Mepal, maybe, just maybe, me and Michael might have room for you in our weekend dream house. Here’s to getaways and dreams.